Those quotes make it sound like somebody will be standing over the soup with their pants unzipped. Steal our fatboy, will ya. Fat Boy? When I first read the headline I thought Rush Limbaugh had gone missing. Hyman Avenue? Everybody make up your own joke. Y'all are on your own - seems I am the only one that the Aspen Times wants to require to register for the article. Fat Boy is one thing - Big Brother is another. Why do I find the Click to Enlarge link under the photo disturbing? He wasn't stolen. I heard he's partying in Tijuana with the Travelocity gnome. Fat Boy is not the only one - reading further down, we see a pilfered the pig and nabbed grizzly bear. Oh, My! *snork* @ this description: "...small, rather rotund, inanimate figurine that resembles a diminutive French chef"
The SRRIFTRAD French Chef was later discovered not to have been stolen. He had temporarily vacated his position in front of the Cooking School of Aspen, and was moonlighting as a midget Sonny Bono at K-Fed's birthday party. Pigs & Grizzlies & Fat Boys, Oh, MY! It must be the lack of O2. Maybe this guy took 'im. Coast: It wanted me to register, too. I refused. Ted Turner has opened a chain of restaurants, "Ted's Montana Grill", here in the Atlanta area. In front of the one near here is a huge fiberglass buffalo on a flatbed truck. He's kinda short, maybe Britney knicked it . . .
And I too am being forced to register. Gestapo like site. Anyone care to copy paste the article here? OK, scratch that. Decided to open it in Firefox instead of my RSS feed reader. And lo and behold, success. Calling all cars, calling all cars: Be on the lookout for a small, rather rotund, inanimate figurine that resembles a diminutive French chef. If apprehended, treat with caution; its safe return might be worth a free and very tasty meal. In yet another of the area's occasional cases of mascot mischief, one of the "Fat Boys" has gone missing from the front of the Cooking School of Aspen and Fine Food Market on the Hyman Avenue mall. The Fat Boys, school Director John Klonowski said, came to the school nine years ago from "some exclusive French chef shop" in Paris. The owners planted the small figurines, which resemble a pair of chefs in full kitchen regalia, in front of the school, and they have graced that spot ever since. Until Friday, when someone nabbed one a day after a school staffer took one of them down from its perch on a wall-mounted planter, where it was temporarily set for the winter, and placed it on the ground. The case of the runaway Fat Boy was not discovered until Saturday morning, when the shop opened for business. "I can't believe it," Klonowski said in tone of mild outrage. "Somebody stole one of the Fat Boys." He called the missing figure "irreplaceable," adding that "with shipping, they're probably worth, oh, I don't know, $175. Apiece!" He said he would be contacting the Aspen Police Department on Monday, but "we haven't put out an all-points bulletin ... we just wanted to get the word out." There is a reward for the Fat Boy's return - one free "entertainment dining experience" at the cooking school, estimated to be worth between $130 and $170. The school can be reached at 920-1879. This is not the first time a local business has lost its mascot to a bit of chicanery. Back in the last century someone pilfered the pig that stands guard over the door to the Woody Creek Tavern, prompting a "rescue mission" by Gaylord Guenin, who at the time was the "mayor of Woody Creek," and a band of local mercenaries. Guenin, whose best guess was that the incident happened "some time in the 1980s," recalled this week that he called the culprits at the Hickory House restaurant, where the pig had been posted over the front door, to warn them of the impending rescue. He said the Hick House staff put a ladder up to the roof to facilitate the rescue. It wasn't too many years later that the snarling grizzly bear above the same door at the Hickory House, which someone donated to the restaurant in response to the pig incident, was itself stolen. The bear was held for weeks before being returned by its abductorTim Dudley 3/27/06 , believed at the time to have been longtime resident character Shady Lane. Actually, "Toilet Brawl" also sounds like a pretty good name for a band. i think he went to visit his brother. Great - now the only thing running through my head is ONE lline of the 1985 Superhit "The Fat Boys Are Back" - but thats theonyl lyric I can remember! Dont know if thats a good thing or a bad thing! See what old skool rap does to your coordination? Actually, I was thinking of the Fat Boys meet the Beach Boys version of Wipe Out. They also re-mixed The Twist with Chubby Checker. And weren't the a-bombs named Fat Man and Little Boy? ASK - apparently Fat Man/Boy went by both names but I think you are right that Fat Man was the most famous. Oh well, the mind is the second thing to go. The third atomic bomb, "Big Boy," was never used because of Japan's surrender. To commemorate the end of World War II, nuclear physicist Richard "Little Dicky" Feynman started a chain of restaurants, with the grand opening on June 28, 1947. In the original restraunts, cooking was done by exposing the food high levels of radiation from a uranium fuel rod. 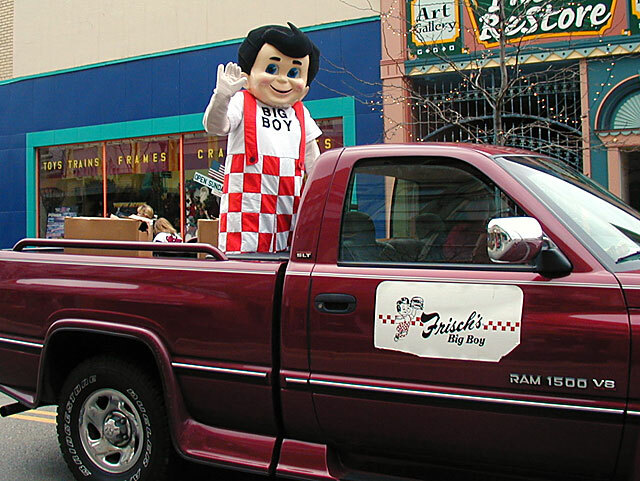 Most "Big Boy" restraunts have now switched over to natural gas, with the exception of "Feynman's Big Boy," in New Mexico, "Teller's Big Boy" in Nevada, and "Frisch's Big Boy" in Ohio, Kentucky and Indiana. The original Big Boy bomb is on display at "Feynman's Big Boy #1" in Albuquerque. Crabby, your sisters have more than one AMC Matador? They must be planning a bunch of getaways! I too can now confess to being in on the theft of a large steer that sat outside a local steak house. We put it on the roof of the gym at our high school two days before graduation. We got napped & didn't get to officially graduate until the steer was taken home. No bull. I was in my ford pinto for that exploit. Another noble steed. He probably went on Atkins. Standing ovation and SNORK @ KDF! *snork* @ ScottMGS and pogo! What you gonna do when they come for you. Oh. I see they've already been here. D. Esker...you bring back such wonderful memories of my girlhood, when Edward Teller regularly appeared on B & W TV, to announce the he had once again decided that the permissable level of 'background radiation' could be raised. It was very reassuring that he managed to keep slightly ahead of the level we were living with on a daily basis througout the above-ground nuclear testing. Ah, those were the days. These fads go in cycles, you know. I feel that it is time we brought back full-scale testing of atomic weapons. The explosions are WAY prettier than the biological weapons we are developing now. I think that as long as the public has to pay for doomsday weapons, we should at least be getting our money's worth, entertainment-wise. Remember, that increase in background radiation was a sign of 'your tax dollars at work.' Nowdays we have no way of knowing if the money is really being spent on ways to kill everybody, or if we are being ripped off. D...You're right -- them mushroom clouds SHOWED where our money went. Remember the figures on how "many times over" the US and Russia could kill everyone on earth? "Them Rooshians have enough nuckewlar bombs to kill everyone on earth ten times over." "Well, WE can kill everyone TWENTY times over. So there!" These are the Fat Boys I'm familliar with. Mushroom clouds? Where the heck did this thread go to?!?!?!? sly..."Fat Boy" = WWII-ending bombs "Fat Man" and "Little Boy" = mushrooom clouds. Wonder if the pig-napping was ever solved. The Woody Creek Tavern was, as I hope you all know, the home away from home of the late great Hunter Thompson, who could well have been involved, but who I actually would have pictured as being one of the mercernaries. >>Back in the last century someone pilfered the pig that stands guard over the door to the Woody Creek Tavern, prompting a "rescue mission" by Gaylord Guenin, who at the time was the "mayor of Woody Creek," and a band of local mercenaries. KOW, thanks for printing the article. I'm a entusiastic supporter of registering for the Miami Herald because that's Dave's paper, but I h ave too much repressed hostility toward Claire "always gets posted" Martin to register for her paper. There. I said it and I feel better.